La vela que está experimentando el desarrollo más significativo de hoy es el spinnaker. Ahora, con la ayuda de mejores telas y tecnología de elaboración de velas, spinnakers son a la vez mucho más eficaces en popa. A través de la experiencia con los barcos casi idénticos la clave para velocidad con el viento en popa se ha determinado tanto por la forma como por el tamaño del spinnaker. Esto es especialmente cierto en cualquier punto de la vela alta de toda carrera. 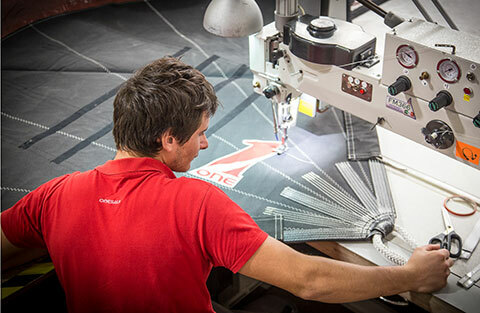 Onesails hace una amplia gama de spinnakers de alta rendimiento para barcos de regata. El diseño de cada spinnaker se personaliza para el barco con el fin de dar un rendimiento verdaderamente superior. El programa utilizado para determinar la forma también tiene en cuenta el desplazamiento para asegurar que la forma coincida con el barco. En Onesails, nuestro equipo de diseño le gustaría hablar con usted acerca de la personalización de spinnakers para adaptarse a su barco. Su experiencia en profundidad que va desde la Copa América de pequeños veleros One Design se asegura de que tienen los conocimientos para ofrecerle el asesoramiento adecuado. Queremos ayudarle aprovechar todo el potencial de su nueva vela(s). OneSails presents the IFS™ (Integrated Furling System), a new style of headsail and downwind sail construction which uses continuous fibre technology to create sails which can be furled without the use of a heavy and expensive anti-torsion cable. IFS™ sails are designed to incorporate a net of continuous structural fibres, laid directly on to the sail’s luff, effectively replacing the cable. The advantages of this technology are considerable. A wider range of sail shapes can be set and furled with sail handling eased by the reduction in weight. 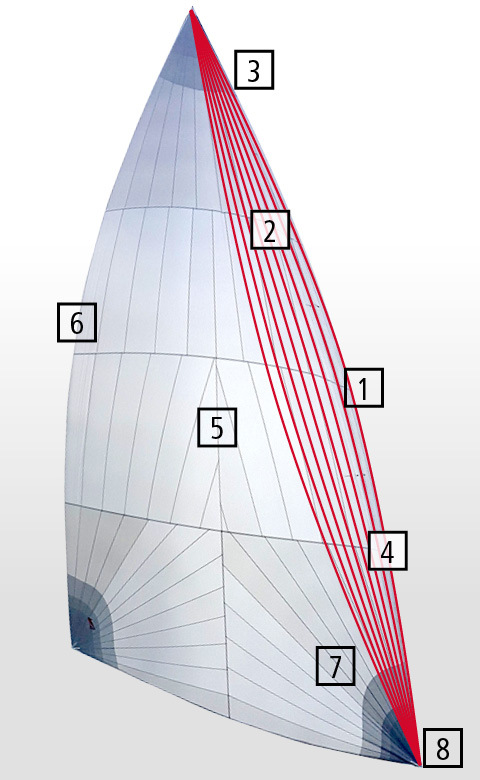 Structure integrated within the sail which allows furling without an anti-torsion cable. Lower halyard tension by 35% when compared to a traditional sail with cable. Without a cable the sail’s luff can be designed to project forward and to windward, improving performance at wider angles. Easy to handle because the furled sail is light and can easily be folded to fit in its bag. Stable leech profile even if measured as a gennaker according to ORC and IRC rules. Lighter sail (without anti-torsion cable). 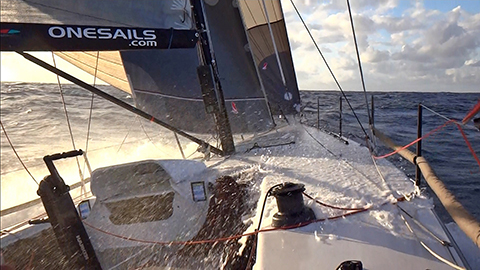 There is nothing more exhilarating in offshore sailing than power- reaching – the point of sail we dream about that makes the other legs of a tough race worth the pain... High speeds, spray and that visceral thrill we get knowing a boat is being pushed to its limits as the miles are speedily devoured. A drawback on this point of sail, however, is the heeling and imbalance that can happen when there’s either too much force on the sailplan from the masthead Code 0 (MH0) or even the fractional Code 0 (FR0), resulting in costly sometimes brutal course deviations to hold on to these sails. Yet the speed and power are hard to give up, even with the extra miles covered – while constantly recalculating the VMG trade-offs against a lower heading. Often the only way to stay high enough to stay on course is to reduce the power and heeling moment by dousing the larger sails and shifting down to smaller headsails. But then there is a significant loss of power and speed, with more of the mainsail needed to maintain drive force. Using more main means shifting the load balance aft, which in turn results in more helm pressure to stay on track. The more main used, the more weather helm needed, and the greater the rudder angle which creates drag, inhibiting speed further. The result is often a ‘void’ for the otherwise well-equipped offshore racer where the sail inventory is simply not optimised to get the best speed at the desired angle. 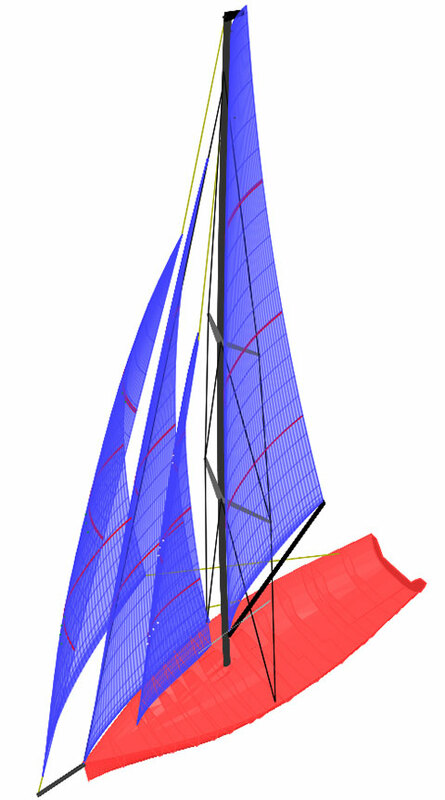 The latest-generation ocean greyhounds chasing course records know this and have been designed with their masts well aft, creating enormous foretriangles in which to fly multiple combinations of headsails and staysails, often mounted on furlers for easy deployment. Not all of us have the luxury of reconfiguring the entire boat – mast position, sailplan and appendages – just to accommodate a larger foretriangle and remain competitive in other sailing modes. But we can find speed in reducing heel while retaining power in the sailplan. OneSails has been working hard on this problem. 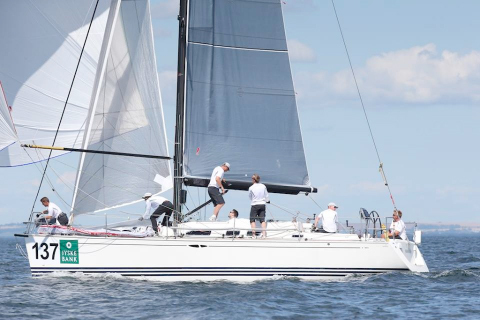 Paul Eldrid of OneSails in Perth is gearing up for the Austral summer season, and examining how to power up a variety of fast designs ranging from a Bakewell-White 36 to a HH42, DK 46, Carkeek 47 and several TP52s. 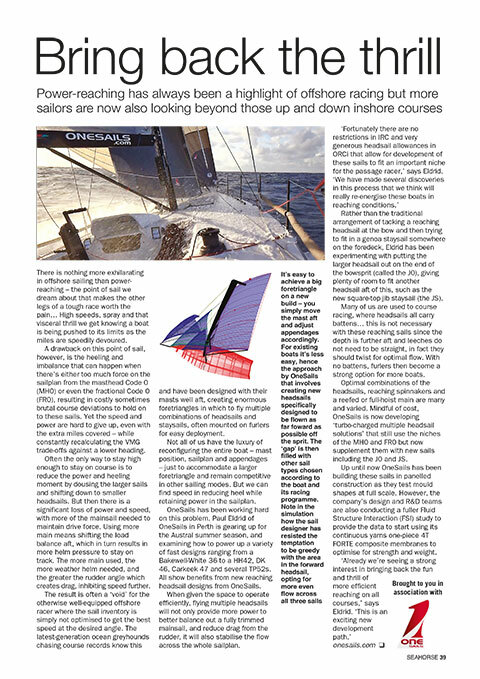 All show benefits from new reaching headsail designs from OneSails. When given the space to operate efficiently, flying multiple headsails will not only provide more power to better balance out a fully trimmed mainsail, and reduce drag from the rudder, it will also stabilise the flow across the whole sailplan. Rather than the traditional arrangement of tacking a reaching headsail at the bow and then trying to fit in a genoa staysail somewhere on the foredeck, Eldrid has been experimenting with putting the larger headsail out on the end of the bowsprit (called the J0), giving plenty of room to fit another headsail aft of this, such as the new square-top jib staysail (the JS). Many of us are used to course racing, where headsails all carry battens... this is not necessary with these reaching sails since the depth is further aft and leeches do not need to be straight, in fact they should twist for optimal flow. With no battens, furlers then become a strong option for more boats. Optimal combinations of the headsails, reaching spinnakers and a reefed or full-hoist main are many and varied. 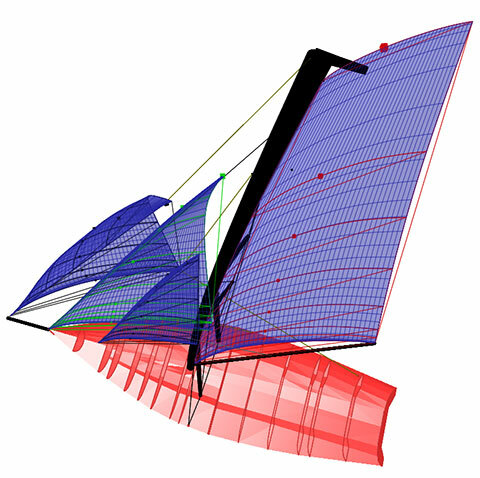 Mindful of cost, OneSails is now developing ‘turbo-charged multiple headsail solutions’ that still use the niches of the MH0 and FR0 but now supplement them with new sails including the J0 and JS. Up until now OneSails has been building these sails in panelled construction as they test mould shapes at full scale. However, the company’s design and R&D teams are also conducting a fuller Fluid Structure Interaction (FSI) study to provide the data to start using its continuous yarns one-piece 4T FORTE composite membranes to optimise for strength and weight. It’s easy to achieve a big foretriangle on a new build – you simply move the mast aft and adjust appendages accordingly. For existing boats it’s less easy, hence the approach by OneSails that involves creating new headsails specifically designed to be flown as far forward as possible off the sprit. Spinnaker staysails can significantly improve the performance also in the inshore windward-leeward courses. Since years OneSails is developing these sails that where present in the OneSails sail inventory of the ORCi Worlds winners. For over 10 years the OneSails design team have developed exclusive technologies to make one-piece continuous thread sails a reality for cruising and racing boats. Features like weight, shape control and deformation resistance means better performance compared to traditional panelled sails. M3™ and 4T FORTE™ membranes are exclusively made in Europe in our unique purpose built facilities ensuring that stringent manufacturing standards are maintained. The best sail shapes are the result of continuous analysis and experience. OneSails is at the forefront of the sailmaking industry, continually investing in research and development to ensure that the very best sail shapes are available. 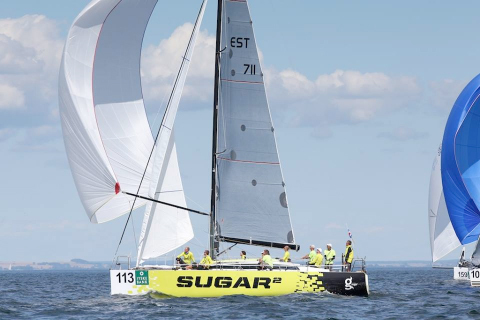 The success of this approach is confirmed by the vast array of racing trophies OneSails clients have won, competing at National, International and World Championship level. A core activity for every OneSails Loft is providing first class service, support and assistance. As part of our service commitment, each OneSails Loft has a team of experts on hand to ensure that we can deliver on our service pledge. In addition to a growing number of principle lofts, the OneSails Group has an extensive network of service centres strategically placed worldwide's coast line.